To Cite: Siverino R O, Uccello A, Giunta M L, Uccello M, Amadio P, et al. Non-Seminomatous Germ Cell Tumor Metastasis to the Jaw: An Imaging Case Report, Iran J Radiol. 2016 ; 13(3):e27812. doi: 10.5812/iranjradiol.27812. Testicular cancer typically spreads to the lymph nodes, but hematogenous dissemination to distant organs can also occur. Bone metastasis is uncommon and is thought to be a poor prognostic indicator. Jaw metastasis is exceedingly rare but is of great clinical significance, since it may be the first sign of an occult testicular cancer or the first evidence of relapse of a known tumor. Herein, we report the first case describing the imaging and clinical findings of a non-seminomatous germ cell tumor with jaw metastasis at diagnosis. Testicular cancer is relatively rare, accounting for around 1% of all male cancers. However, it represents the most common form of cancer in males aged 15 - 35 years. More than 95% of testicular tumors arise from the germ cells. Testicular germ cell tumors can be subdivided into two major groups: seminoma and non-seminomatous germ cell tumors (NSGCTs). The vast majority of NSGCTs contain a mixture of two or more histologic patterns, known as mixed germ cell tumor. NSGCTs tend to be more aggressive than seminomas and less responsive to radiation therapy and chemotherapeutic agents (1). Testicular cancer mainly metastasizes to lymph nodes, but can also invade distant organs via the bloodstream (1, 2). Bone involvement is uncommon and seems to confer a poor prognosis (3, 4). Although exceedingly rare, metastasis to the jawbone is of great clinical significance, since it may be the first sign of an occult testicular cancer or the first evidence of relapse of a known tumor (5). We present a case of NSGCT with extensive bone involvement and jawbone metastasis at diagnosis, highlighting clinical and imaging issues. In July 2011, after a car accident, a 34-year-old male patient was referred to the emergency department suffering from low back pain and motor deficits of the left lower limb. A lumbosacral spine X-ray was interpreted as showing an L3 traumatic fracture. Upon further investigation, the patient reported undervalued symptoms, such as jaw pain and the presence of an indolent left testicular swelling justified by the patient himself as the result of a testicular biopsy performed years earlier while he was searching for causes of infertility. Computerized tomography (CT) scanning revealed a structural alteration in the L3 soma that was a frank pathological fracture (Figure 1). Furthermore, there were several enlarged lymph nodes in both the para-aortic and the paracaval regions (Figure 2), as well as a remarkable thrombosis of the inferior vena cava slightly below the renal veins (Figure 3). The clinical and CT findings recommended extending the evaluation to the pelvic region, and a testicular examination was performed. Upon CT evaluation of the scrotum, a tumor was found in the left testicle, highly vascularized on both the arterial (Figure 4) and the venous phases. The tumor was deemed to be responsible for the vertebral metastasis. No metastases were found in the liver or lungs. 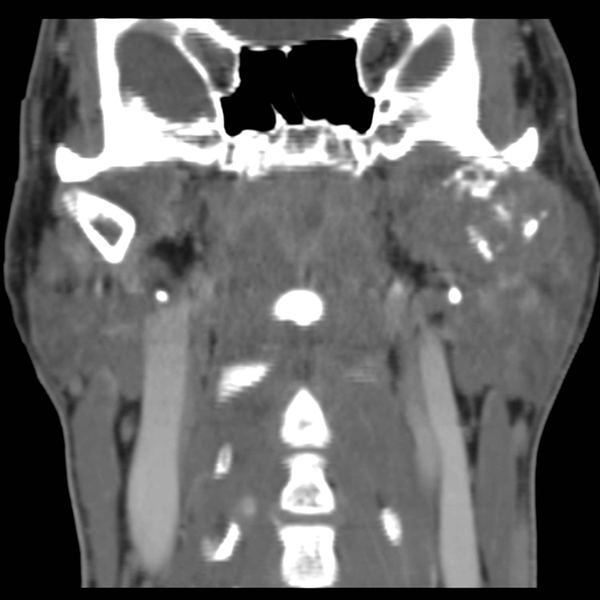 According to the clinical picture, additional CT examinations were extended to the neck and brain, which displayed a highly vascularized 4.5 cm lesion of the left mandible (Figure 5), disrupting both the mandibular ramus and the condyle, and embedding the parotid space at full thickness (Figure 6). In August 2011, the patient underwent a left radical orchiectomy in order to achieve a definitive diagnosis and to start appropriate anticancer treatment. The pathology report revealed a mixed germ cell tumor mainly composed of immature teratoma with malignant transformation (70%), embryonal carcinoma (20%), yolk sac tumor (5%), and seminoma (5%). Figure 1. A 34 year-old man with L3 pathologic fracture. Sagittal (A) and coronal (B) multiplanar reformatted CT images show multiple fracture lines and anterior wedging of the left L3 vertebral body. Figure 2. 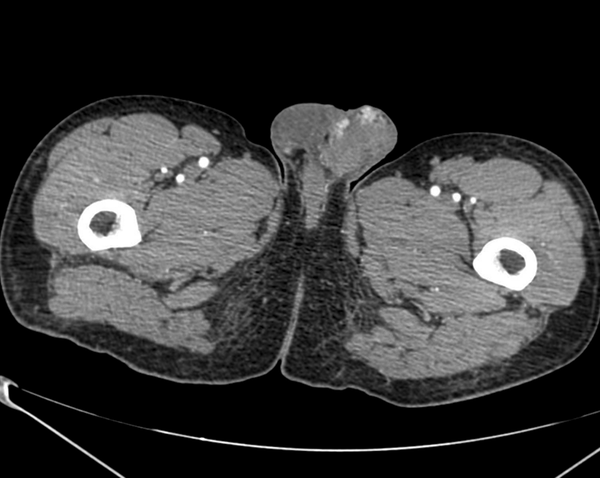 Abdominal imaging; CT scan displays L3 involvement, lymph node metastasis in the left para-aortic region, and thrombosis of the inferior vena cava. Figure 3. Inferior vena cava thrombosis; coronal (A) and axial (B) delayed-phase CT images reveal thrombosis of the inferior vena cava. Figure 4. Primary tumor; the left testicular tumefaction exhibits high vascularization on arterial-phase CT images. Figure 5. Jaw metastasis; A, Soft tissue and B, Bone window CT images show a jawbone metastasis disrupting the left mandibular condyle. The metastatic tumor massively extends into the surrounding soft tissues. The diagnosis of testicular cancer focuses on clinical and instrumental elements. Cryptorchidism is the most significant risk factor for testicular cancer, increasing the risk up to 11-fold. Testicular cancer classically manifests as a painless swelling or enlargement of the testicle. However, about 10% of patients manifest new-onset testicular pain. Additionally, nearly one-fourth of patients with metastatic disease complain of metastasis-related symptoms (e.g. low back pain caused by metastatic lymph nodes or a primary tumor located in the retroperitoneal space) (1). Scrotal ultrasound, as a first-step test, shows lesions that are dimensionally higher than 5 mm and allows the discernment of cystic lesions from neoplastic ones, while also taking vascularization into account. The serum markers α-fetoprotein, β-human chorionic gonadotropin, and lactate dehydrogenase can be useful for diagnosis, treatment, and surveillance (1, 6). 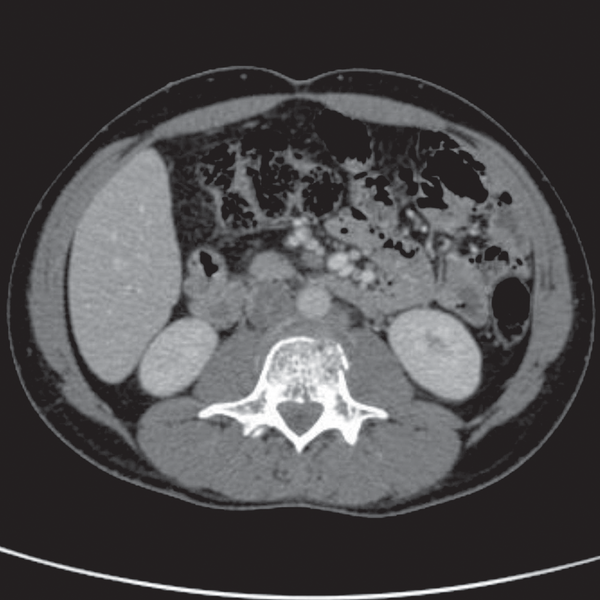 CT images show the presence of an intratesticular mass that is often morphologically patchy, containing ill-defined necrotic spots. CT also allows the pinpointing of potential secondary tumors. Magnetic resonance imaging is rarely indicated because of the costs and superimposed results with regard to CT (6). Radical orchiectomy represents the primary treatment for most patients presenting with a suspicious testicular mass. Orchiectomy is both diagnostic and therapeutic. Given that the testis can act as a sanctuary site for tumor cells from chemotherapeutic agents, orchiectomy should be performed even in the case of metastases suitable for biopsy (1, 7). Patients with metastatic NSGCTs are usually treated using a multimodal approach consisting of systemic chemotherapy followed by consideration of post-chemotherapy retroperitoneal lymph node dissection (1, 8). Given that testicular cancers are curable even in the presence of metastatic disease, the correct staging is a critical component for treatment decision-making and the prognosis. Testicular cancer typically spreads via the lymphatic system in a step-wise sequence. The primary lymphatic drainage of the testis is to the para-aortic lymph nodes at the level of the renal vessels. From there, the cancer may spread to the iliac and mediastinal lymph nodes, and then on to the neck lymph nodes (2). In advanced disease, hematogenous dissemination to distant organs may occur at sites including the lung, liver, brain, and bone. Bone is an uncommon site of metastasis from testicular cancer (1, 4). Clinically detectable bone metastases occur in around 3% of patients affected by metastatic germ cell tumors. Bone involvement usually occurs in later stages after the failure of previous therapy, while bone metastasis found at the time of diagnosis is thought to be a poor prognostic indicator (3, 4). The jawbones are an occasional site for metastasis from primary malignant tumors elsewhere in the body. Tumors most likely to spread to the jaws include breast, lung, kidney, colon, and prostate cancers. Testicular cancer is the source of jawbone metastases in about 5% of male cases (5, 9, 10). The pathogenesis of the metastatic process in the jawbone is unclear. Within the skeleton, the favored sites of metastatic deposits are the bones that are rich in red marrow, such as the pelvis, trunk, sternum, skull, and long bones (11). On the other hand, the jawbone has little active marrow, particularly in elderly individuals. Nevertheless, remnants of hematopoietic active marrow can be detected in posterior mandibular areas, and hematopoietically active sites enhance the recruitment of metastatic cancer cells (10, 12). Moreover, the rich network of capillaries in the oral cavity and chronic inflammation processes can promote the various steps involved in tumor metastasis (9-13). There are very few reports in the literature regarding jaw metastasis from testicular cancer (14, 15), and this is the first case describing both clinical and imaging findings of jawbone metastasis from NSGCT at diagnosis. The present case underlines that physicians should take into consideration the possible presence of jaw metastases in cases of atypical symptoms, even in young men with a known diagnosis or a suspicion of testicular cancer. The authors kindly thank Alessia Trovato for providing language help and writing assistance. Authors’ Contribution: Acquisition of data: Rita Olivia Siverino, Maria Luisa Giunta, Alessandra Uccello; analysis and interpretation of data: Rita Olivia Siverino, Alessandra Uccello, Maria Luisa Giunta, Giuseppe Petrillo; drafing of manuscript: Rita Olivia Siverino, Maria Luisa Giunta, Mario Uccello; critical revision: Mario Uccello, Placido Amadio, Giuseppe Petrillo.